Among the historic streets and buildings of the centre of the city of Valencia is a true architectural gem: the Mercado Central, a key point of economic and commercial development in this Mediterranean city which has adapted to new times and technologies. 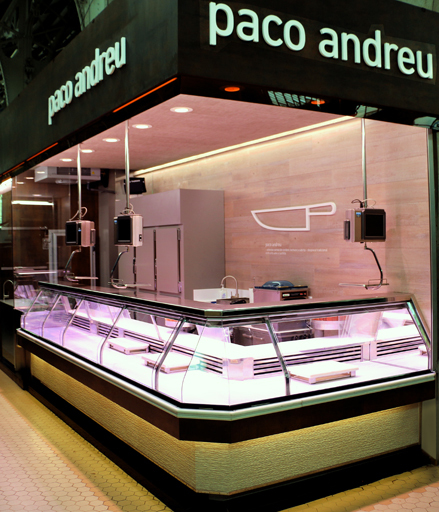 Among the almost 300 businesses which carry out their activity in this emblematic building from the start of the 20th century, we find Paco Andreu, an establishment of select meats. 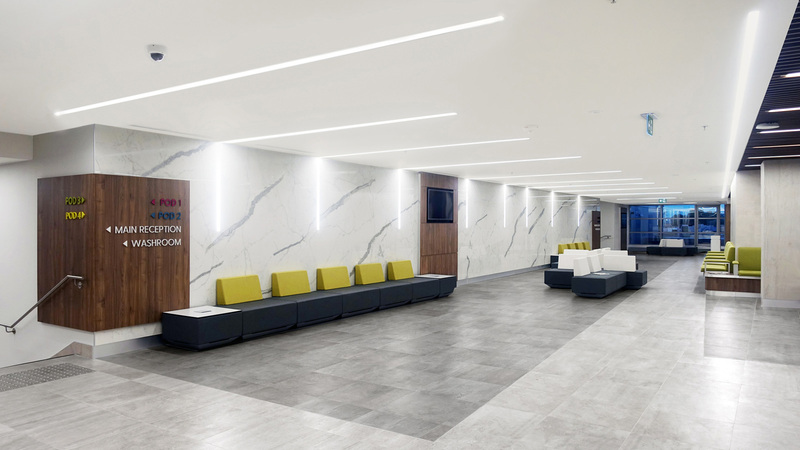 This firm has used one of the most innovative materials from the PORCELANOSA Group in the recent renovation of its facilities. 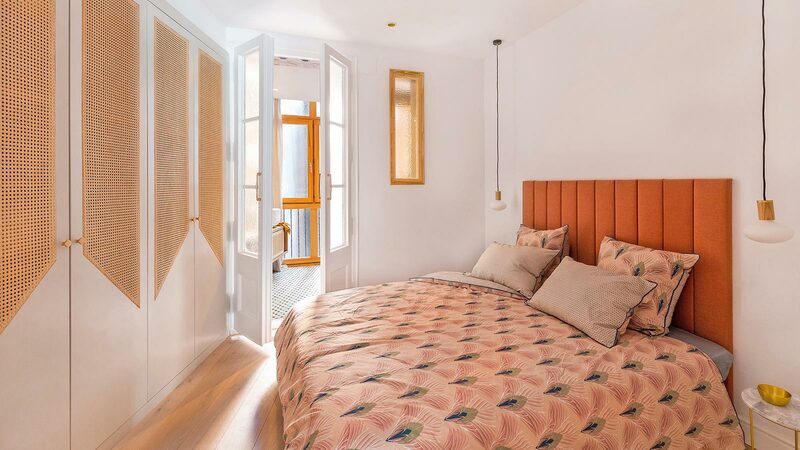 This project was undertaken by the José Saus Grupo Interiorismo interior design studio. VF Superficies Sólidas has manipulated Krion®, working with the versatile solid surface to refit the interior of the counter, as well as the work countertop and the establishment’s sink, all in a white finish. 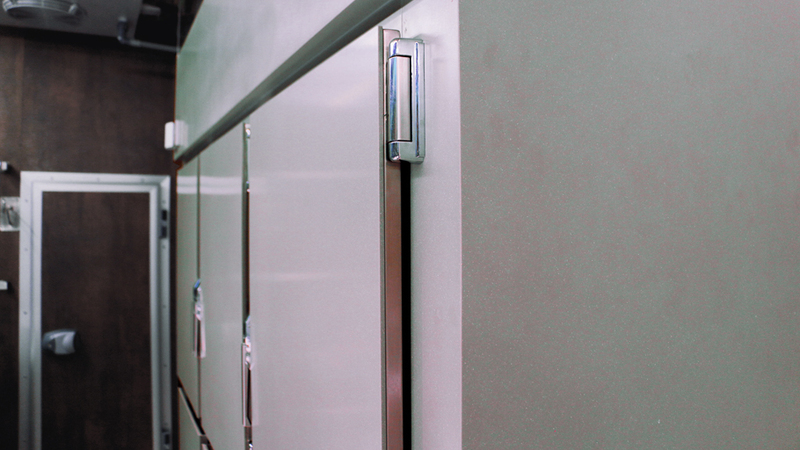 To refit the exterior panels of the refrigerator, a grey tone of the compact mineral from PORCELANOSA Group was chosen. 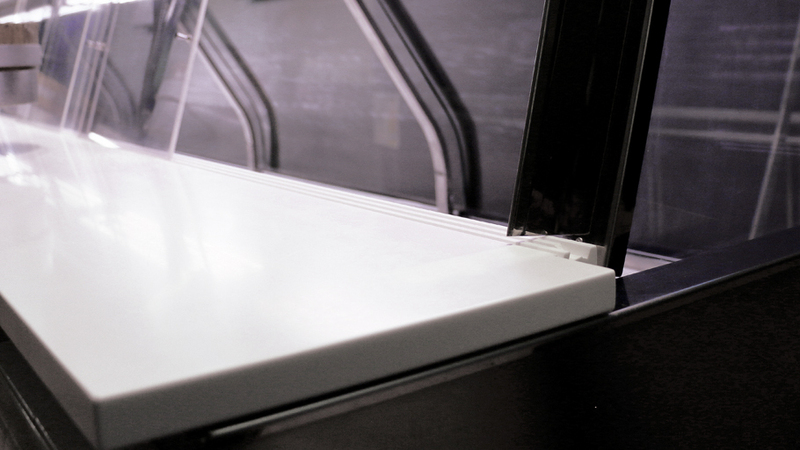 Krion® has also been used to create the insignia and logo of the brand on a relief; the signs of identity of this well-known establishment. 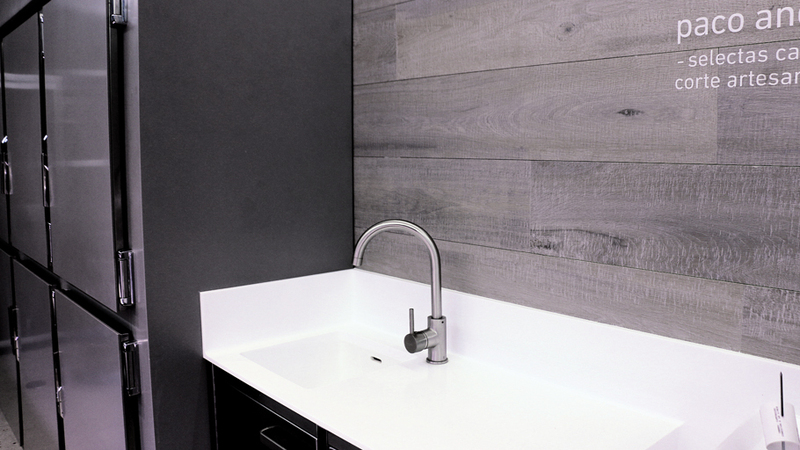 As well as its aesthetic finish and modern image, the antibacterial, additive free quality of the compact mineral developed by PORCELANOSA Group is the main characteristic which led the leaders of the Project to choose this solid surface, fulfilling the hygienic requirements of an establishment with these characteristics. 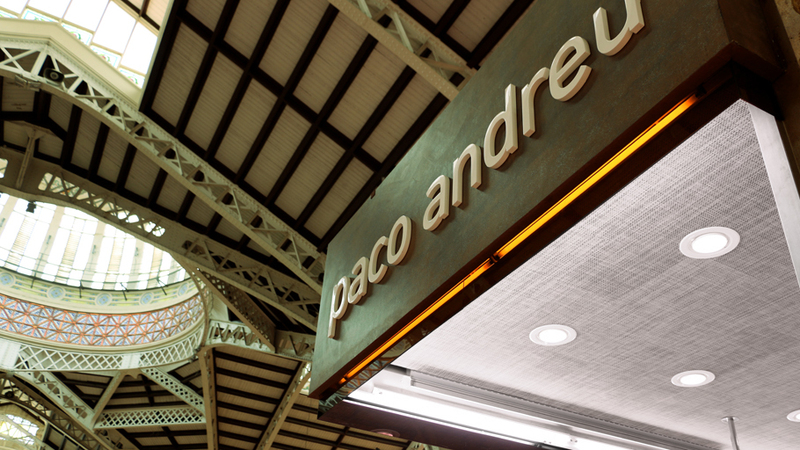 Additionally, the renovation of the Carnicería Paco Andreu butcher’s in the Mercado Central de Valencia market used the Linkflor vinyl covering by L’Antic Colonial, using it in an original manner as a covering for the ceiling at the point of sale. 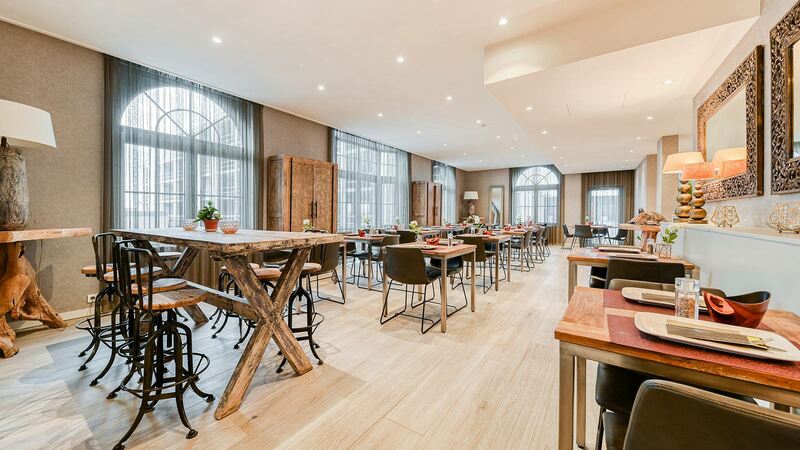 Specifically, 15 square metres of Contract Clay Linkfloor have been installed on the ceiling, where various points of light have been integrated thanks to the lightness and ease of manipulation of this vinyl material from L’Antic Colonial. 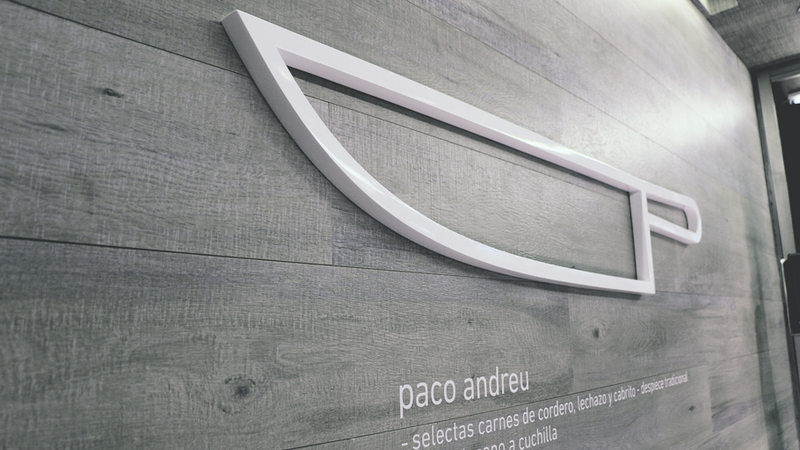 The José Saus Grupo Interiorismo interior design studio has also used the ceramic materials of the Group’s firms: the Par-ker® Britania Top ceramic parquet from Porcelanosa as a wall covering, and the Nara Basic Beige covering by Venis in the area under the counter.